Does your accounting outsourcing provider offer direct contact with your accountant? A lot of accounting outsourcing providers don’t give firms the opportunity to communicate directly with their remote staff. Time to sort out accounting queries. If you want a job done fast and you and your accounting outsourcing team must go through other channels to pass information between each other this can add a lot of wasted time when you need work back fast. Miscommunication between remote staff and your office. If your accountant asks a question via somebody else their question may either not be understood by you, or you may mistake exactly what they are asking. This can add to further delays which can cause you money in wasted time and create headaches for both parties. 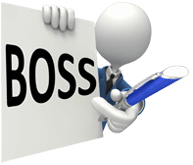 BOSS offers clients the opportunity to communicate directly with their accounting outsourcing staff whether they engage a full-time dedicated accountant, part-time, casual or the newer service we offer called the Freedom Service (minimum 50 hours per month). You have the ability to quickly get in touch with your accountant to ask and answer queries making a big savings on time and removing any delay frustrations. After all, they are your staff, so why wouldn’t you have the chance to communicate with them directly? BOSS’ newest service has been welcomed with open arms as BOSS now takes on all the risks involved with hiring staff. As well as all the usual needs being met like; hiring, quality of work, training and HR, BOSS now has created something new named the Freedom Service which works 100% on a fixed fee basis. All jobs are performed with fixed fees rather than the traditional charging out on hourly rates. This takes out the anguish of any potential budget overruns. Clients can know exactly how much a job is going to cost them before a job starts, saving them a lot of money annually! The service also benefits firms because they no longer have to pay out for annual leave, sick leave and public holidays. (Or any other leave that employers are normally entitled to pay) Imagine being able to hire all your accountants this way! The only requirement on your behalf is giving BOSS 50 hours per month. There are no other costs involved in bringing on a freedom service accountant and as per usual, you have the choice of changing accountants if you’re not happy with them or cancelling with a month’s notice. It’s quite the offer. If you’re at all wanting to learn more about how the Freedom Service could benefit your firm please get in touch by booking a call.